A leading website translation provider and proud partner of WPML. In an increasingly international, outward-looking world, expert and efficient website translation services will allow your business to reach a much larger number of possible clients, and raise your online profile significantly. Whether it be towards one key language whose market you aim to break into, or any number of the many global languages we translate into, our website translation and localization services, by linguists who are tech-savvy and familiar with the online world, help businesses across a range of sectors branch out beyond their usual circle of customers. Our professional team of linguists only ever work in their mother tongue, ensuring a fluent, natural-sounding result. We manage all of the content of your website, from text to images, videos to meta descriptions, we take care of it all. Our tech-savvy translators are mindful of not just the linguistic elements of your site, but the technical and multilingual SEO elements too. By using the WPML plugin, you don't have to worry about the technical side of inputting the translated text into the back-end of your CMS. Just download the WPML plugin, and we take care of the rest. Download WPML. Top-quality digital marketing translation plays a crucial role in positioning your website high in the SERPs. With experts in multilingual keyword research, we ensure your business has the best chances of ranking locally. Why Choose Us To Translate a Web Page? As a proud partner of WPML, the number one multilingual website plugin for WordPress, we understand that websites are more than just their content. We can help with translating websites and reformatting numerous features of your web pages such as widgets, tools, and built-in apps, ensuring that the final multilingual website retains full productivity in its translated form. Given the importance of a good online profile that reaches across the world, working with our expert linguists means you can trust that our website translation services will help increase your customer reach and drive sales. Our hand-picked linguists only ever translate into their mother tongue, in what promises a reliable, natural-sounding translation that native speakers can connect with. Each of our website translators is guaranteed to be technologically, as well as linguistically, fluent, in what allows all of our customers to benefit from the peace of mind of knowing that their translation is in excellent hands. Our website linguists have a solid understanding of Content Management Systems and know exactly how to work with website material. By translating your web pages, your content can be understood by a larger number of potential customers, in turn drastically improving your chances of success in foreign markets. Opening up your products and services to international customers, coupled with multilingual marketing, could lead to a significant increase in the overseas sales of your company. Translating your web pages into another language improves your chances of ranking locally in Google and allows you to target the keywords your customers search for in their own language. Translation into other languages improves the UX of your foreign customers as they will be able to fully understand your product or service and navigate your website without any frustration. For those times when the little details really make a difference, we can advise you on and carry out localisation services for your websites. The benefit of localisation over translation is the emphasis it places on shaping your content to the exact needs and expectations of readers around the globe. For example, making sure cultural references that wouldn’t carry across the channel are reworked in the French translation of your website. Being able to make an instant connection with customers on the other side of the globe is a huge advantage of a good website translation. Our mother tongue translators, with their idiomatic grasp of the languages they work towards ensure that your translations have exactly the desired impact on your international readers. Say goodbye to awkward phrasing and hello to website content that clicks immediately with your readers. WHAT ARE MULTILINGUAL WEBSITE TRANSLATION SERVICES? Are you looking to translate your website into other languages to increase your customer reach and drive online sales? Whether you’re a small-scale startup beginning to expand into the international market, or a large company hoping to appeal to a foreign audience, those who invest in multi-language websites and localisation have absolutely everything to gain. As a language service provider promising to deliver an initial quote for all potential jobs within the hour, obtaining a web page translation service need not be a time-consuming process for your business, while our affordable prices will let you increase your market share without breaking the bank. Our web page translation services are the ideal solution for a wide range of different website types. Perhaps you are selling a unique product on your website in the UK, but want to ensure international buyers can access it too. We can offer a flawless translation of websites for online shopping, so that you are guaranteed connectivity around the world, giving you the best chance of increasing profit. Or maybe your website has a more informative purpose, and you need a website translation that will reflect that. 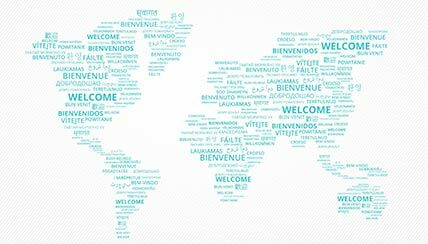 Whether you’re an NGO, public body or international advice service, our web translation services ensure you get your vital information across clearly and accurately in every language you choose to translate into. Our desire to make the process as straightforward as possible for you means we are equipped to work with a vast range of website design platforms so that your completed e-commerce translation or web page localization retains its original format. If you prefer us not to work directly in your CMS, then you can deliver your web material in either Word or Excel and we will prepare it for you to upload yourself. We have been providing translation services for many years. Our emphasis on quality and customer service above all else means you can rest assured that we will find the best website translator experienced in translating into the language you require, but equally one qualified in technology translations. This additional requirement is one we believe truly sets our website translation agency apart from so many others on the market: your translator will fully understand the ins and outs of the target market, so nothing is ever left to chance or guesswork. We also assign you a tech-expert to your project who will leave you free to focus on other things – no more worrying about how to fit your newly translated website’s copy into a WP plugin! Using our website translation services is the best way to ensure that the person carrying them out understands the subject matter they are working on. Only specialist translators work on our translations, so the meaning of your document is never lost, and important details are always preserved across all of our translations. When we offer our website translation services, we like to make sure the client knows exactly what they’re signing up for, so our friendly team will make sure they carefully advise you on the precise type of translation or localisation to fit with your business model. Contact us about website localisation services, and one of our team will get in touch with you within the hour.